We've been a huge fan of Rae Morris for a long time here, reviewing and interviewing her early in her career. Ahead of her long long-awaited debut album, she's released a new EP Cold. The lead track is a duet with Fryars and is a huge departure for her. 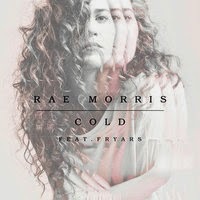 Cold is Rae Morris growing up in front of us. Gone is the nervous giggling teenage girl slurping on a can of coke and reading from a book of lyrics and what we have in its place is a confident young woman, equally at home with solo piano tracks as she is incorporating the dancefloor elements which course through the title track as she and Fryars dissect the remants of a failed relationship - "cut me and my blood runs cold for you". It may shock some of the fans who'd followed her from the start, but it's a natural progession as she diversifies her sound. Second track Skin goes back to more familiar territory with Rae's voice taking centre stage as she tells of "breaking the rules and listening to our skin, breaking our hearts and pretty much everything". Lyrically she's progressed to writing about love and loss and the depth and range of her voice makes her utterly convincing. Third track Eye To The Storm highlights the way in which she can use her voice to ensure there's a lot of diversity to her repertoire of songs without alienating those that were first drawn in by those beautiful scratchy demos. It takes her back to her roots where the piano is the main instrument and there's slight hints of Badly Drawn Boy's Once Around The Block in there that keeps you humming this one. It's the strongest song on the EP in our humble opinion. We can live without remixes of most songs and whilst the final track, a Jack Steadman remix, does manage to at least resemble the original song, there's very little of Rae's voice on it, which sort of renders its inclusion a bit pointless. But in an era where a digital EP is generally classed as three songs, we can let that lie. Rae Morris just hasn't grown up in the past two years, she's blossomed from a potential next big thing amongst a gaggle of female singer-songwriters into a very special talent. She may not ever reach that chart success that her record label has spent so much time developing her towards, but she'll have her own unique niche in a genre that's bursting to the seams with artists that never quite get to the heights that they're aiming for. Her debut album, when it finally arrives, promises to be a very special record indeed. She's out on a tour of her own in September before supporting George Ezra on a number of dates in the UK and Europe later in the year.